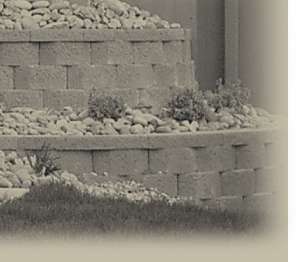 Testimonials / References for Cornerstone Retaining Walls, Inc. Words are not adequate to express how pleased we are with your work and our new retaining wall! We're so glad we found you, this has been a most pleasant experience! Your expertise and professionalism, as well as that of your crew are unmatched! Thank you again, we'll have no problem referring our friends to you. Please use us as a referral. We hired Cornerstone Retaining Walls for a townhome common area project. We asked Clint Pino to build an 8” high, 60-foot-long Allan Block retaining border to hold rock in, close to a steep slope behind 2 townhomes. I anticipated a short, stumpy wall without much charm. I was astonished and extremely pleased with the actual result. Clint Pino and his crew created a beautiful work of fine craftsmanship that will last for many years to come. Their achievement inspired us to create steps and borders ourselves out of similar Allan Block materials and to lay a paver patio. What began as a project simply to hold 3 tons of rock in, to create a walking path where grass wouldn’t grow, turned into a work of art and a totally new outdoor living area. Clint Pino was professional, prompt, dependable and quite creative. He is an expert in his field, yet he was easy to talk with, offering excellent suggestions when asked and listening carefully to what we wanted. He adapted to our needs and far exceeded our expectations, at an excellent price. I highly recommend Clint and Cornerstone Retaining Walls. In April, 2009, I retained Cornerstone Retaining Walls, Inc. to tear out an old concrete retaining wall and replace it with a block wall around the south and west corners of my home. I primarily worked with Clint Pino, although all of the representatives I met were friendly and courteous. From the initial estimate to the completion of the project, I was very pleased with Cornerstone's prompt and professional services. Of the four estimates I received, Cornerstone was the only contractor that made an extra effort to match blocks that I already had in order to eliminate the waste of existing materials. That same flexibility continued through the project. I was particularly concerned about the removal of the old deteriorated south wall and its prompt replacement. However, after the old wall was removed, Denver had an unexpected blizzard. I was particularly impressed by Cornerstone's self initiative to arrive early in the morning the day of the blizzard, and work in rainy cold conditions, to ensure the portion of the wall that concerned me (and more) was completed before the storm hit. The outcome of the retaining wall and the project in general exceeded my expectations. Cornerstone did an exceptional job of advising me as to the status of the project, keeping the project on schedule and keeping the premises in neat condition.